Here our some of our vintage holiday picks in the shop! You can't go wrong with these styles. 1. The Black Jumpsuit- Can be styled in an infinite amount of ways. 4. 80's Sequined Batwing Jacket- looks great over everything. Especially with jumpsuits and trousers. 5. Sequined Party Dress- All you need is minimal accessories and you are good to go. 6. Gold Fringe Earrings- Perfect with a minimal look. 7. 80's Studded Purse- Goes with everything. 8. 80's Avant Garde Origami Dress- This is a show stopper. You can't get any better than this. You can find all of these items and more in our Etsy Shop! Here are some of our shop favorites at the moment! Everything is available in our Etsy shop! 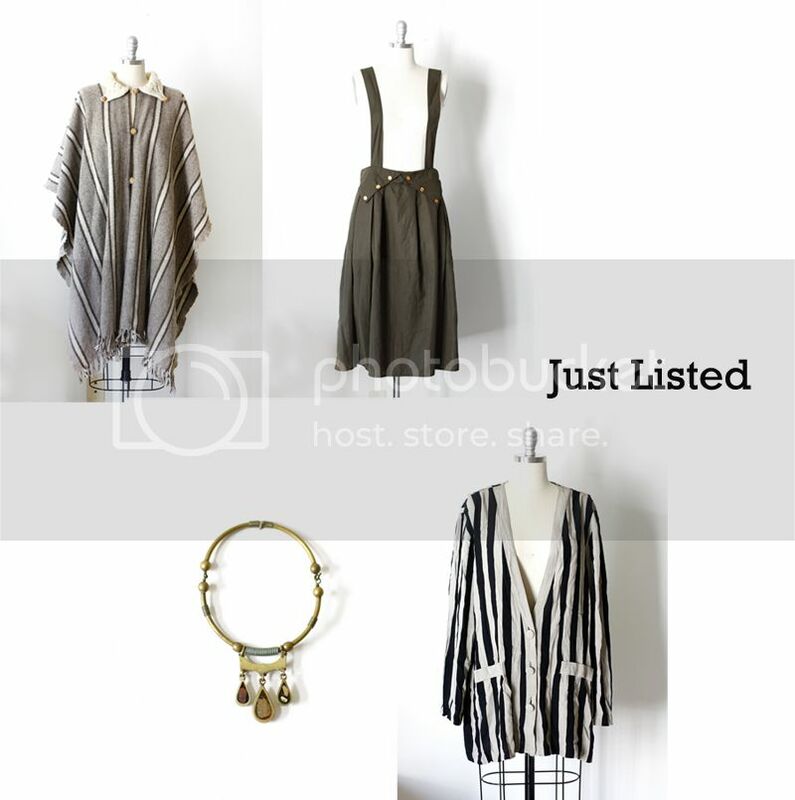 Prints, Patterns, Nuetrals, Minimalism, Modern, Boho and more have just been added to the shop! Did you know that we are listing items at least 3-4 a week? Be sure to check out our Etsy shop daily for new arrivals! This is by far one of my favorite dresses in the shop right now! It has a minimal pattern, slouchy fit, and beautiful color to transition into fall. All you need is some awesome minimal heels and you are good to go. Be sure to check out both items in our Etsy shop! There is something special about vintage Guess Jeans. You can dress them up or down and they still have the look of perfection. Check this pair out in our Etsy shop! Tons of new arrivals have just hit our Etsy Shop!!! So many new things have been added to our Etsy Shop!! For this week's post we asked one of our longtime customers (not to mention one of our closest friends!) Daniella Alcedo to showcase a few of our favorite pieces in the shop! These 90's Guess Red Denim Shortalls are a definite must have for spring/summer. They have the perfect 90's touch and an excellent pop of color. On Daniella, we paired these shortalls with a simple basic tank, statement bracelet, and some platform lace ups. You can find these shortalls in our shop here! We are so happy to have Daniella guest appearing in our How to Wear posts for the next few weeks!